Disclosure: I received the following chair for review from Ingenuity. All opinions are my own. I am a huge fan of products that can grow with your child. Ingenuity has done so beautifully in the Trio 3-in-1 High Chair which converts from a full size high chair to a booster and then a toddler seat. The Avondale print is fresh and modern with the multi-colored Chevron with an Elephant detail. 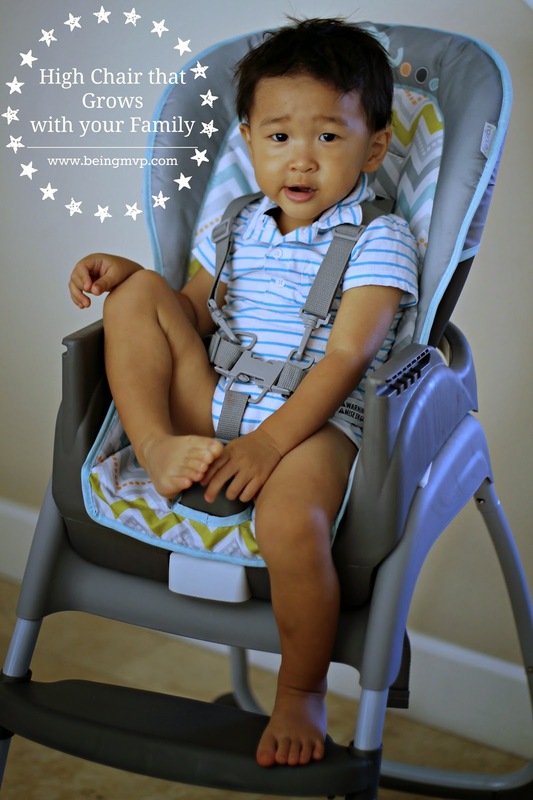 One winner will Receive the Ingenuity Trio 3-in-1 High Chair! I love the double tray that you can wash or put it in the dishwasher! I love that the seat is removable and can really grow with the child to eliminate all of the various chairs you eventually have to buy. I love that it goes from highchair to booster seat to another chair. I think it would be great because we are still in highchair stage, so a lot of room to grow with it. I love how this converts to a toddler chair, that is so handy! I know the double tray feature is common but I love that too, we don't have one on ours! I love that this chair is so versatile and LOVE the toddler chair. This would be perfect for my family because I just had a 2nd child and my first is outgrowing his high chair. I would use the toddler chair first and then use the high chair for the baby. Like the booster seat to toddler seat with ease. I love this! It eliminates the need to buy a booster type chair once they get a little older. Cute print designs as well which is always a plus! I think it is a great concept that would grow with my child and save me a lot of money in the long run. I love that you can actually have TWO highchairs instead of one!! this looks amazing! i could really use this for my new baby, I love the reclining positions too. I love how easy it is to transform. And especially for different dining chairs! I like how this chair can be used as a highchair and booster that can be attached to a regular chair. We are expecting, and would love this chair for our little one. I love that it can be used for so many years in so many different forms. I like the versatility of this chair. I would totally use the booster in restaurants and at family functions. I don't really care for the restaurant boosters available for use because they usually don't have straps and once my son fell out of one and hit her chin on the table. Plus, they tend to be covered in germs. So carrying our own in the van would be ideal. I like that this high hair can also be a chair for older kids. My son is 7 and right at the weight limit and could use this to give him some extra height at the table. I love that it attaches to any chair. I love that it is a 3 in 1 chair that grows with your child. This highchair would be perfect for my sister who is expecting her first baby. I like that I would never have to buy another high chair, because I'm on a limited budget. The high weight limit is great because I have a large baby. I love that we can attach it to one of our chairs! I really like items that grow with my children. I like that the top part pops off so you can still use it for an older child. It also looks easy to remove without any extra parts. Wow! What a great, versatile chair! I love that it is 3 seats in one, it would be great to only have to purchase one! I love that it is 3 seats in one! I love that the chair can be removed and strapped down to any chair. Also like it converts to a chair for an older child. I think it would work perfect for my family. I love that the seat can be removed and fit onto any chair. I love that it grows with my child so we do not have to purchase multiple chairs. I really really love that it grows with the baby. Right now I have a toddler, I would be using it as a toddler chair, and by the time he outgrows it, we will probably have a new baby that can start using it as an infant high chair :) so it is something that will last and be used. would work well because we just had our third baby and hadn't got a new high chair for her yet , very convenient that it grows with the child to! I love that it turns into a booster seat and that the cover comes off so that you can wash it. I love the Ingenuity line of products! The pattern is really cute too! I love that it gives you so many options and that it grows with your child! I really like that it can change from different types of chairs as your child gets bigger. it would work perfectly for our family, because when our older son grows out of it, we can use it again for our 2nd child. This is a great chair. I like that it can become a booster seat - very versatile. I love that it grows with your child. I like that the seat changes function for every age and stage! I love that the top of the tray pops off making it so easy to clean. I love that the seat pops off as well and can be put on a chair! This would be great for our growing family. I like how it lasts you through many stages of babyhood to childhood and is so easy to clean! I like that you don't have to buy a separate booster seat after using a highchair. I also like how the tray is dishwasher safe. Besides it growing with your child, I love that it has the three reclining options! Thanks! I like that it converts, so you can use it longer. I love that it grows with my child! It will save money over time!! I love that you child can use it for a long time. Plus it looks like a great quality product with a long lifetime of use. I love that it's a three in one so it will work from baby up to toddler and i don't have to run out and buy a high chair and then a booster!